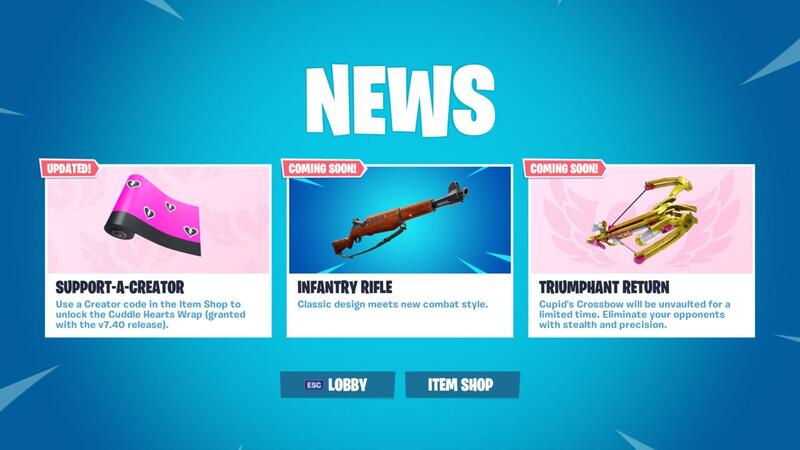 Fortnite 7.40 Update Adding New Gun "INFANTRY RIFLE"
Fortnite Season 8 is coming very soon, but now developer Epic Games roll out another update for the hit battle royale game. Update 7.40 is slated to arrive on all Platforms on 12 Feb and These new update introduce another new weapon to the game. The New gun is arriving and new type of gun called the INFANTRY Rifle. It's description does not show full information. The gun is listed as the "Coming Soon". The developer detailed a number of balance and gameplay adjustment it is implementing with 7.40 update. Full update detailed when update goes alive,but among other thing, Epic is increasing the reload time for Rocket Launchers and reducing the amount og structure damage Hand Cannons deal.